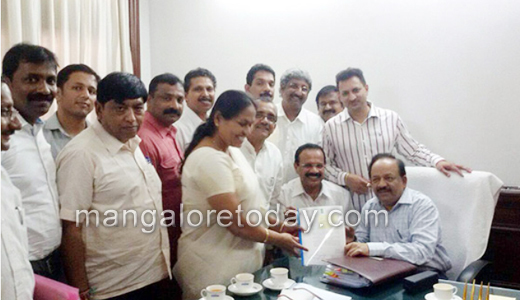 Puttur, Aug 14, 2014 : A delegation led by Union Railway Minister D.V. Sadananda Gowda met Union Health Minister Dr Harshavardhan in New Delhi on August 12, Tuesday and submitted a memorandum to him seeking protection of the interests of the areca growers by withdrawing the affidavit filed in the Supreme court over the issue of areca ban. The delegation also met Union Commerce Minister Nirmala Seetaram and requested for steps to prevent import of areca sans any duty from foreign nations. The delegation included Nalin Kumar Kateel, Shobha Karandlaje, Ananth Kumar Hegde,C. M. Udasi, MPs, CAMPCO President, Directors Konkodi Padmanabha, Sanjeeva Matandur and Chanila Timmappa Shetty.